These jelly filled muffins from Eating Well Magazine are a fun and nutritious take on the jelly doughnut. 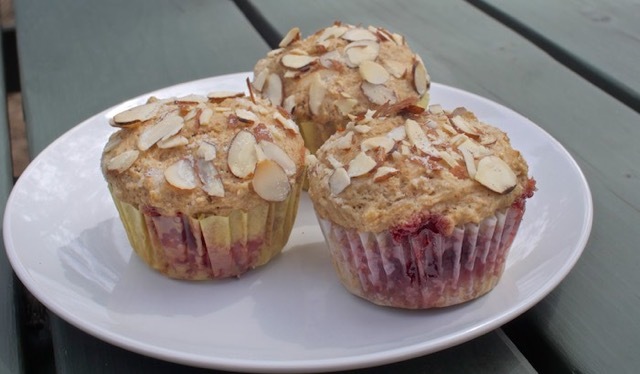 A basic whole wheat muffin is filled with your favorite low-sugar fruit preserves and studded with almonds, offering just the right amount of sweetness. They freeze well and make a great portable snack option for when you are on the go. Preheat oven to 400°F. Coat 12 muffin cups with cooking spray. Whisk whole-wheat flour, all-purpose flour, baking powder, baking soda and salt in a large bowl. Whisk eggs and brown sugar in a medium bowl until smooth. Add buttermilk, orange juice, oil and vanilla; whisk to blend. Add to the dry ingredients and mix with a rubber spatula just until moistened. Scoop half the batter into the prepared pan. Mix jam and almond extract; drop a generous teaspoonful into the center of each muffin. Spoon on the remaining batter, filling each muffin cup completely. Sprinkle with almonds, then sugar. Bake the muffins until the tops are golden brown and spring back when touched lightly, 15 to 25 minutes. Loosen edges and turn muffins out onto a wire rack to cool slightly before serving. These look delicious! I love that you used whole grain flour too! I love the idea of a jam filled muffin! These look so yummy and I love the addition of the orange juice! I love jam filled muffins, these sound wonderful! A perfect mid-morning snack if I ever saw one! I really appreciate that they're not overly sweet, too. I love any sort of almond bread or pastry, so I know I'd gobble up these muffins. That jam center is just a bonus! What a pretty muffin, I would sure love one right now! I love the almond studded topping and the jam in the center is a nice surprise. A nutritious snack that tastes like a jelly doughnut? Sign. Me. Up. Jam filled muffins sound delicious! They look so pretty, too! Mmm. Now I am craving muffins. These look fabulous with the nuts on top. Thanks for sharing with us on the #HomeMattersParty I hope you will join us again next week. A perfect mid-morning snack if I ever saw one! I really appreciate that they're not overly sweet. I love that you used whole grain flour too!